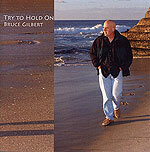 CD review: "Try to Hold On"
Longtime mainstay of the local rock and jazz scene, Bruce Gilbert has been better known as a sideman for other musicians than as an artist in his own right. He spent his early days gigging with Paul Barrerre (Little Feat) in the late '60s, and his most recent as a saxophonist with the late Buddy Blue's jazz band, appearing on his albums "Pretend It's Okay" and "Sordid Lives." Slowly robbed of his ability to play by Parkinson's disease, Gilbert is no longer able to perform on saxophone and piano. And yet, despite this undoubtedly difficult challenge, Gilbert's new CD shows a singer with a slyly confident delivery, and a songwriter of no mean talent who has collected a baker's dozen of his own songs in an impressive collection. Possessed of a rich baritone voice and a knack for turning out lovely melodies, Gilbert's new musical side is more personal  and personable  than his work backing other musicians. Likely reflecting his own eclectic career, the songs here range from the folk rock of "Midnight Water" to the blues of "Full Pockets," the jazz-rock fusion of "Lie to Me" to the Southern California country-beach rock of "Blue Sarong." Throughout, there's a familiarity to the playing and delivery  he has the same relaxed ironic humor as singers like Randy Newman, Mose Allison and Leon Redbone. Having a legend like Barrerre contribute ever-so-sharp guitar leads and solos to "Lie to Me," "Just Can't Seem to Wake Up" and "Money That Doesn't Belong to Me" is just gravy.